Gladstone, NJ – October 7, 2012 – The country’s top young riders were on display today during the 2012 Platinum Performance/USEF Show Jumping Talent Search Finals East. Leading an exceptional group of 92 entries, 17-year-old Jacob Pope of Columbia, MD scored an exciting victory during the prestigious event at the USET Foundation Headquarters in Gladstone, NJ. Pope’s scores were at the top of the leader board following the head-to-head final four jump-off where he showcased his skills on all four mounts during his debut at the event. This weekend’s competition began with three phases including flat work, gymnastics and jumping. Judges Karen Healey and Robert Ridland awarded scores in each phase, and the top four finishers returned for the final ride-off, competing on their own horses as well as the three other competitors’ horses. Riders returned for the final round with a clean slate, earning new scores for each individual ride. Jacob Pope, winner of the 2011 Emerging Athletes Program (EAP), led the way following the flat and gymnastics phase, and with a score of 92 during the jumping phase he maintained his leading going into the Final Four. The course challenged riders with a triple bar, open water, liverpool double combination, and a triple combination. Meg O’Mara and Catherine Tyree were tied for the second before the third phase and solid scores over fences helped them maintain their position for the ride-off. Yesterday’s fourth place rider Mattias Tromp dropped down after a disappointing round, but Sylvia deToledo jumped up from the seventh place ranking into the Final Four after earning a score of 86 for her efforts in the ring. Pope, O’Mara, Tyree, and deToledo were the elite four to compete in the final phase of competition. The horse rotation included deToledo’s mount Drake owned by Donald Stewart and Derbypie LLC, Tyree’s mount Can Can, O’Mara’s mount Fernway Park, owned by Donald Stewart and Pope’s mount Uno, owned by Heritage Farm. The test included the triple bar, an oxer-vertical double combination, as well as multiple rollbacks and bending lines. Both today’s first course and the final were meant to test what the riders learned during yesterday’s gymnastics phase and their ability to adjust their mounts. The competition stayed very tight until the last fence of the final rider. Pope set the standard with a score of 94 aboard Uno, but after lowering the height of the final Swedish oxer on his second mount he opened the door with a score of 81. He recovered with scores of 92 aboard the remaining horses, but O’Mara was close on his heels. She earned a 92 riding Fernway Park, followed by an 89 and an 88. It looked like the victory was in her hands, but she as the last rider at the very last fence in the last round she had an unlucky distance and a hard rub that earned her a heartbreaking 87. Pope’s score totaled 359 for the championship win, while O’Mara claimed the reserve position with a score of 356. deToledo continued her climb through the ranks, earning a total score 345 for the third place honors. Time faults with three of the horses proved costly for Tyree, who ranked fourth with a score of 338. It has been a whirlwind year for Pope after his EAP victory last fall. 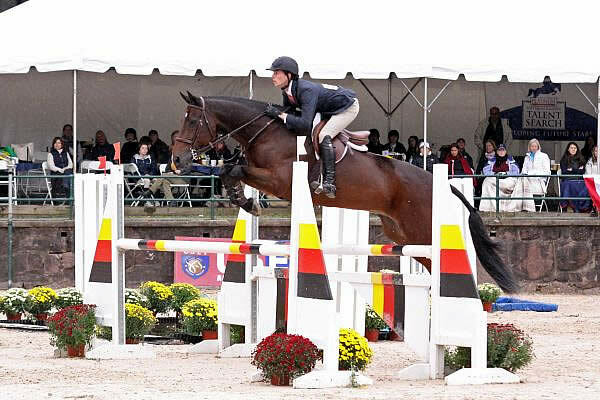 His trainer Street Moore from the McDonogh School pushed him to join program, which helped Pope earn a ticket to the George Morris Clinic in Wellington, FL. Patricia Griffith and Kent Farrington recognized Pope’s talent and recommended he begin riding with Andre Dignelli at Heritage Farm, where he became a working student. At the end of the day, Pope took home the French Leave Memorial Perpetual Trophy, donated by the Gerald A. Nielsen Family and the led the victory gallop. Trainer Andre Dignelli of Heritage Farm received the Leading Trainer Award, donated by the late Mr. Hugh J. B. Cassidy, III. The final award went to Drake, the mount ridden by deToledo, who received the Best Horse title, the “Grappa” Trophy, donated by Sarah Willeman. This was the first weekend that deToledo had ever ridden Drake, showcasing the talent this event lets shine through. The Platinum Performance/USEF Show Jumping Talent Search Program seeks to educate and test participants by encouraging Juniors and Young Riders to develop show jumping skills, thus laying the groundwork for future international successes. 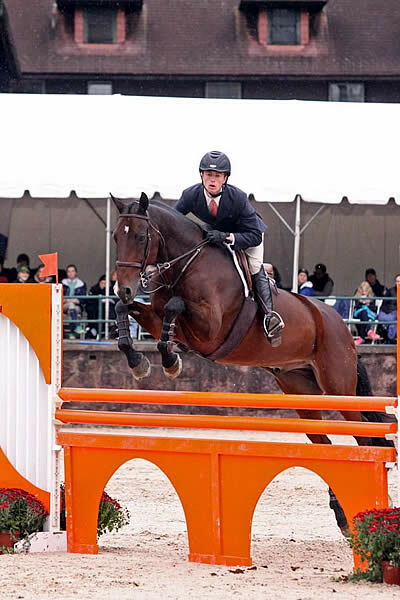 With Finals held each year on the east and west coasts, this program has produced some of the country’s top jumping riders including McLain Ward, Richard Spooner, Lauren Hough, and Meredith Michaels-Beerbaum. 2012 Champion Jacob has proven his talent and now joins the list of prestigious winners. For more information about the 2012 Platinum Performance/USEF Show Jumping Talents Search Finals East, please visit http://usef.org/_IFrames/breedsdisciplines/discipline/alljumping/sjTalentSearch.aspx.